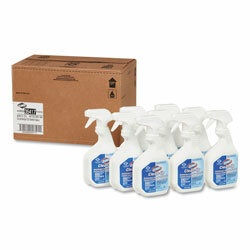 Clorox® Clean-Up® Disinfectant Cleaner with Bleach is a powerful one-step cleaner, disinfectant and stain remover. It eliminates odors caused by bacteria, mold and mildew. With Clorox® Clean-Up® Disinfectant Cleaner with Bleach, you can clean and disinfect confidently with the power of Clorox® Bleach. From Clorox Commercial Solutions®, this fresh smelling spray cleaner is perfect for use in offices, day care centers, restaurants, schools and other commercial facilities. Spray every drop with Smart Tube® technology that reaches to the very bottom of the bottle. Stock up and save! Application: Disinfectant/Cleaner; Applicable Material: Ceramics; Cement/Concrete; Enamel; Fiberglass; Glass; Grout; Laminates; Metal; Plastic; Sealed/Engineered Stone; Vinyl; Dirt Types: Bacteria; Body Fluids; Dust; Germs; Grease; Oil; Organic Matter; Viruses; Water-Based Soil; Scent: Fresh. 32 oz Disinfecting Wipes, Cleaners and Sanitizers from Clorox! 5767 In Stock today.